We provide a wonderful massage experience using natural essential oils that is healthy for your skin. All massages are performed in a soothing environment to help you take away the stress of your life and relieve all your tension in one go. We offer a range of massage types including Aromatherapy, Remedial, and Hot Stone. If you would like to know more about our services to pick which is right for you, feel free to speak to one of our friendly staff members. Aromatherapy is the science of smell. The nostrils are directly attached to the part of your brain which controls emotions and influences your nervous system and hormones. We use essential oils that when inhaled, will reduce your stress levels and blood pressure. These oils also absorb through the skin to heal and calm your muscles and nerves. This type of massage is designed particularly for stress relief and emotional healing. Remedial massage is beneficial for everyone ranging from the elite athlete to the office worker. It’s tailored to your specific sport or body type by focusing on areas of the body that are overused and stressed from repetitive movements. It addresses particularly the recover phase of the muscular system after it has endured intense physical activity. A variety of techniques may be used during this treatment including Swedish, deep tissue and stretching depending on the individual. It will help alleviate headaches, neck and lower back problems, sciatic pain and postural tension. Private health funds rebate available. 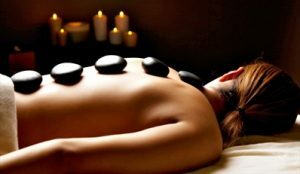 Hot Stone Massages are a unique style of massage that incorporate smooth, heated stones to aid in relaxing the body and soul, warming up tight muscles and releasing deep tension more quickly. After this style of massage, your muscles will be effectively relaxed, any pain you are suffering from is likely to be relieved, your blood circulation is increased, toxins are removed from your body and the natural flow of energy will be freed. This body scrub is designed to exfoliate your skin using natural ingredients. The scrub is made up of white and brown sugar, salt and kiwi seeds for a highly effective and safe beauty treatment that will cleanse your skin from deep within and encourage natural cell regeneration as well as leaving your skin feeling silky smooth. This treatment includes a full body exfoliation using Guinot Sugar Kiwi Scrub followed by a massage using a specialized essential oil blend, designed for total relaxation. You’ll leave not only feeling relaxed and refreshed but with a beautiful, natural looking golden glow. For full details on pricing or to book an appointment, call us on (07) 3349 8313 or simply drop by to speak to one of our friendly staff members at Mount Gravatt.